Clenzoil Gun Cleaning Products are one of the best cleaning agents we have come across. By formulation it is a metal cleaner, lubricant, protectant, rust-inhibitor that can be applied to any known metallurgical surfaces that respond to lubrication and rust-protection. 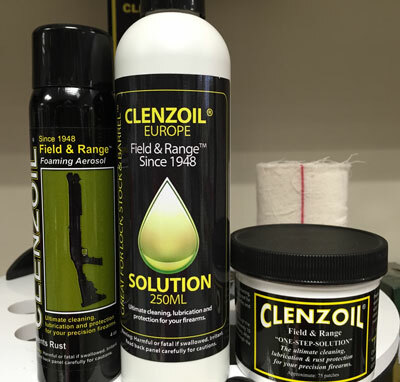 We stock the Field & Range one step solution (you are able to rub this on the wood too! ), the Foaming Aerosol Cleaner which is brilliant for cleaning barrels, the Bore Patches & Hinge Pin Jelly and the Unloaded auto clips for semi-automatics 12 & 20 gauges. Please ask us if you have any questions regarding Clenzoil.